Heating and cooling your business is expensive. However, you can reduce your energy bills and protect your bottom line with these tips. At the end of every day, go to each thermostat in your workplace and turn it down. Make sure to get them all. If you have more than one business location, visit each location and repeat this step. Next, invent a way to prevent your employees messing with the temperature. We're just kidding. You can't do all of this. But a smart business security system with Alarm.com Smart Thermostats can. The award-winning, ENERGY STAR certified Alarm.com Smart Thermostat is unique. Alarm.com Smart Thermostats have an energy-saving "Away" mode to turn your heating and cooling down when you don't need them. It's easy to schedule. You can then enhance your schedule with automatic adjustments based on everyday activity at your business. For example, you can have your thermostat automatically switch to Away mode when you lock up and turn the alarm on at the end of the day. In the morning, you can have it turn heat back up when the first employee unlocks the front door. Once activated, these smart, "set and forget" features can deliver substantial energy savings with no extra effort required. 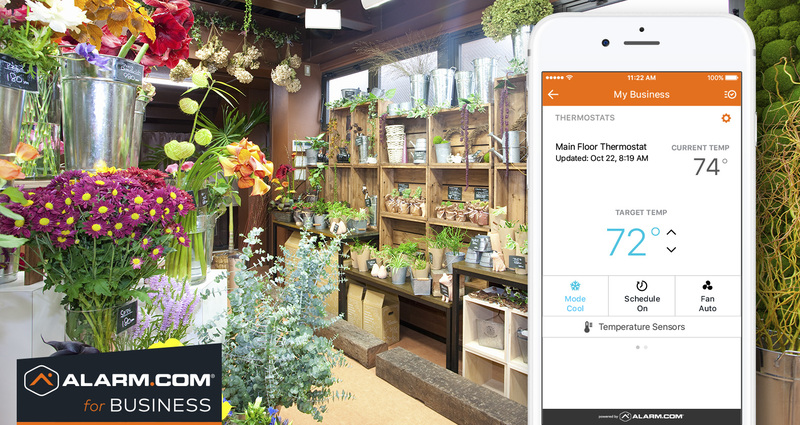 The Alarm.com for Business smartphone app gives you handheld control of your thermostats from work, home or anywhere in-between. You can check or adjust the temperature of any thermostat, switch between modes, or alter your heating and cooling schedules using our easy slider. Your thermostats can also warn you early about HVAC system issues, giving you time to act before a problem becomes a disaster. An early-morning low temperature alert in midwinter (indicating a heating system malfunction) can make the difference between an emergency visit from your HVAC repairman, and an all-day closure due to burst water pipes. While you're worrying about high energy bills at work, your employees typically aren't. It's why they sometimes crank up the heat when you're not there, or run the AC when windows are open. Alarm.com's local restrictions keep this under control for you. You can set a minimum and maximum temperature for any thermostat, allowing employees to adjust it but only within a given range. You can also lock a thermostat entirely with our Local Lockout setting, and control it solely with your app. 4: Protect inventory with smart temperature sensors. Your Alarm.com service provider can install remote temperature sensors alongside your smart thermostats. These small devices let your thermostats read the temperature in important but out-of-the way areas like storerooms or display cases. Here's how one business uses them to safeguard valuable inventory. Every business and owner is different. Our smart thermostat is adaptable and versatile, with an array of smart, energy-saving features and rules for you to select and customize for your business. 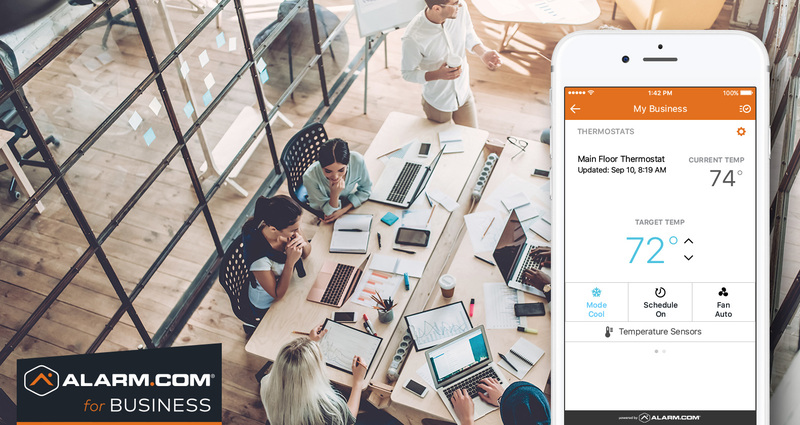 With Alarm.com's all-in-one solution, app and web dashboard, it's easy. 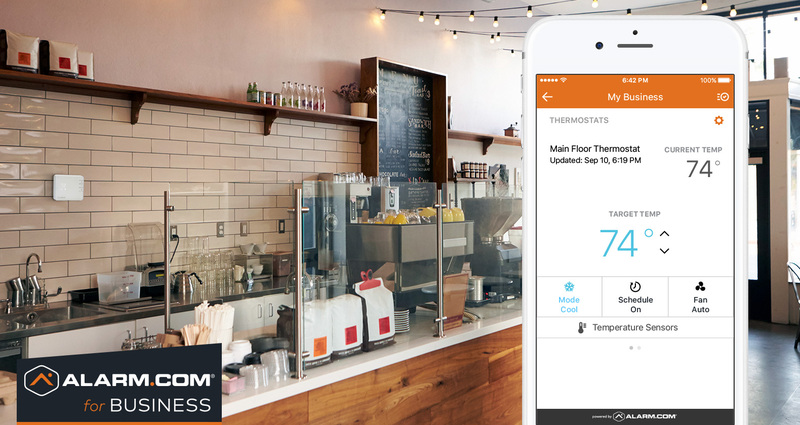 Want the Alarm.com Smart Thermostat at your business? 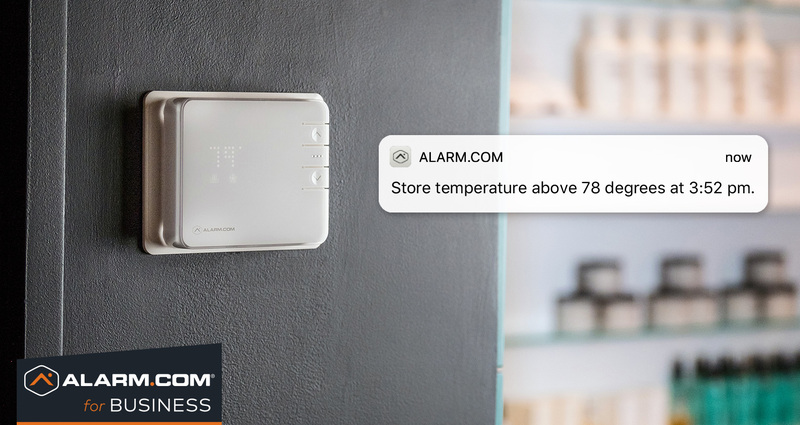 Professionally delivered by authorized service providers, the Alarm.com Smart Thermostat is available exclusively as part of Alarm.com for Business: the all-in-one solution for smart business security, access control, smart video monitoring and energy management. To find out how to get Alarm.com for Business, click here. Ready to upgrade your business? Enter your ZIP code in the box below.